Bad breath is an unfortunate and delicate matter. It can subtly affect your life personally and professionally. You communicate with people so many times throughout the day that it’s important that you do not ruin someone’s impression of you with your bad breath. Luckily, there are many methods of cleaning your mouth and eliminating odors. You can take the obvious steps in keeping your mouth clean. It’s similar to shaving your beard. 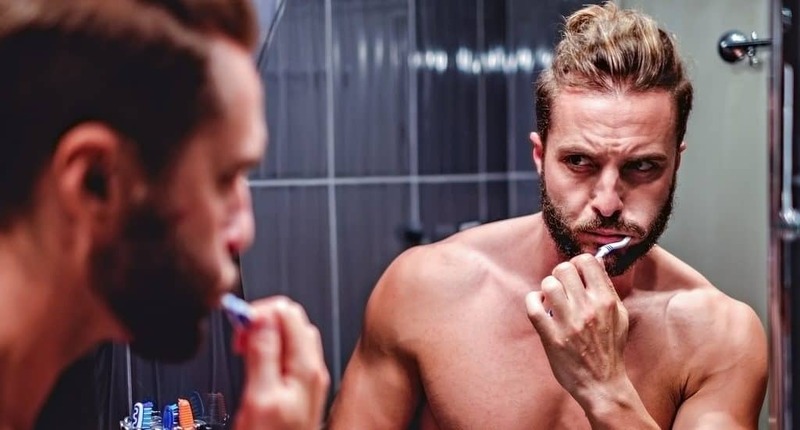 You’ll want beard care products explained. You’ll want to know the correct way of shaving with a straight razor and trimming a beard with an electric beard trimmer. You also want to be aware of the extra steps you can take such as starting to use a beard catcher. Just like you would care for your beard, you want to care for your mouth. The first and most obvious way to help combat bad breath is toothpaste. The right toothpaste can make all the difference, so you want to make sure you’re choosing the best one. While toothpaste can make a huge difference, it’s not the only thing you want to do to achieve oral hygiene. Here’s everything you need to know to choose the best toothpaste for you and the right dental hygiene routine. Halitosis is the term that medical professionals use for bad breath. Every 1 in 5 people has suffered from halitosis. Many of those people do not realize it, while many other people are scared that they have it all the time. The paranoia seems to come from the stigma that society has placed around bad breath. The causes of halitosis are usually simple and preventable, but it can sometimes be much more serious and need medical attention. Knowing what’s causing your bad breath is the easiest way to determine how to fix it. Why Does Your Breath Smell Bad? If you eat particular a food or drink specific drinks, then you have a greater chance of developing bad breath. Some of these foods include onions, coffee, and garlic. While these foods have great taste, they linger when they absorb into your bloodstream. These foods will not only make odors emit from your mouth but other pores in your body. If you do not have a proper oral hygiene routine, then bacteria can build up in your mouth and cause bad breath. The bacteria that builds up feeds off the food particles left in your gums and teeth. After they feed on this debris, they produce waste that smells. Flossing is extremely important. When you forget to floss, particles of food you eat get stuck in your gums and between your teeth. The places that they gather are places where the toothbrush can’t reach. When you don’t floss, that’s when bacteria build up. Bacteria is a huge reason for bad breath. While flossing helps to get rid of the bacteria that builds up around the teeth, bacterial growth on the tongue is often forgotten. Bacteria on the tongue accounts for the majority of cases of bad breath. Smoking is another cause of bad breath. The chemicals you’re inhaling leave behind a residue that will be hard to overcome. You and your friends will be thankful when you quit. If you have an extremely dry mouth, you have no saliva to wash away any excess bacteria or food particles that you may have hanging around in your mouth. That bacteria causes bad breath. Similar to dry mouth, morning breath is a product of saliva not being produced. When you’re asleep, your body makes less saliva, meaning that there is nothing to wash away the bacteria in your mouth. Infections are an easy target for bacteria to gather. If you have a wound in your mouth or have experienced oral surgery, try to get antibiotics that will prevent an infection from developing. Be sure to keep any and all mouth wounds clean for your health and oral hygiene. Sometimes bad breath is completely out of your control. It’s not always controlled by your decision to do something or not. Sometimes bad breath is a result of certain medical conditions. These conditions include ailments related to the kidney and liver, gastrointestinal disturbances, diabetes, chronic bronchitis, respiratory tract infections, tonsil stones, and sinus infections. If you’re experiencing chronic bad breath without any diagnosis of a condition, contact your doctor immediately. If your sinuses get inflamed, or you have sinusitis, then you have the chance of mucus getting caught in the back of your throat. This phenomenon can cause a postnasal drip. Like most reasons for which bad breath occurs, the mucus that collects in your throat experiences a buildup of bacteria. If you need a quick-fix for your bad breath, then there are a few things that you can do. Biting into a fresh apple or some other raw fruit can freshen up your breath if you can’t get to your toothbrush. 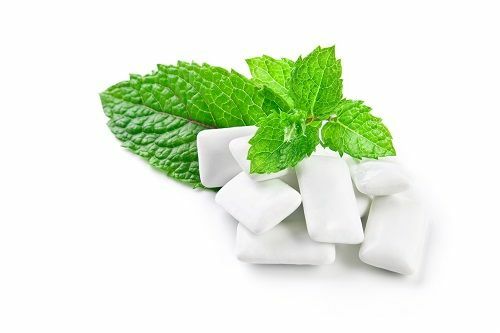 If you’re carrying around some sugar-free gum, pop some in your mouth to get a quick refresh. Gum also helps you to produce more saliva, so your body can wash away that bad breath-causing bacteria. Water can do the same thing as saliva and is a quick remedy for morning breath. Other ways that you can prevent bad breath for the long run involve investing in your dental hygiene routine. Upping your dental hygiene keeps you one step ahead of bad breath. Be consistent in your daily oral hygiene, and you won’t have to worry about halitosis. Your daily oral hygiene routine should include an electric toothbrush and a good brand of toothpaste. An electric toothbrush does a better job than traditional toothbrushes. They reach places normal toothbrushes can’t and are more effective at removing plaque. Some even come with 2-minute timers, allowing you to brush for the right amount of time every time. The toothpaste you choose is also extremely important. There are so many choices to choose from, and you want to choose one that targets your problems. The best one to choose is one that targets the bacteria that causes plaque as it will eliminate bad breath. What Should the Best Toothpaste for Bad Breath Have/Do? Toothpaste that eliminates bad breath should do so by targeting the bacteria that causes plaque. It should prevent tooth decay, which can also cause bad breath and other common causes of halitosis. Any toothpaste that targets plaque and smells good can work to keep bad breath at bay. What Are Key Ingredients to Look for? The best ingredient to have in your toothpaste to eliminate bad breath is sodium fluoride. It can be found in many brands of toothpaste. It has the ability to eliminate the harmful bacteria that cause plaque in a matter of seconds. The plaque that builds up is what is responsible for bad breath. 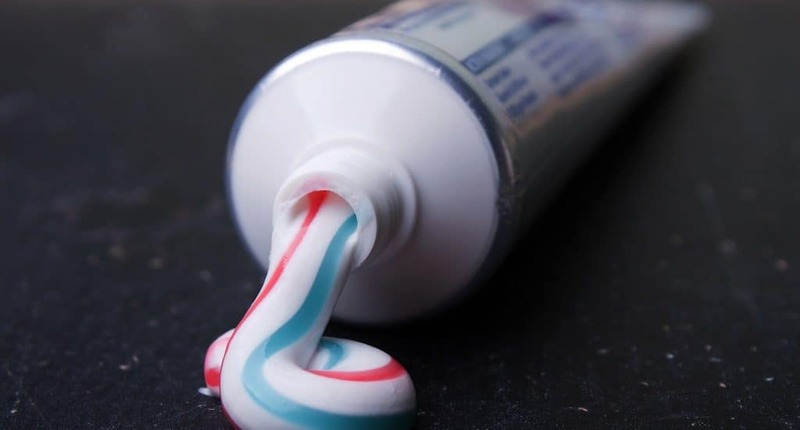 Besides sodium fluoride, other natural ingredients you can find in toothpaste include vegetable-based glycerin, zinc, essential oils, and the Dead Sea salt. These ingredients are all great for suppressing bad breath. This combination also does a good job of whitening your teeth. There have also been some studies that have shown that Dead Sea salt is extremely effective. A study over 10 years showed that children who rubbed Dead Sea Salt on their gums were free of any dental diseases. What Is Ideal Complimentary Oral Hygiene Routine? Brushing your teeth regularly is the step in the right direction, but there’s more you can incorporate into your routine to stop bad breath. The first step you can take is floss regularly. Flossing removes food debris that is stuck between your teeth. Food particles are common culprits of bad breath, so flossing is a quick way to prevent halitosis. Mouthwash is another important part of a good dental hygiene routine. A bit of swishing for a minute or so can eliminate bad breath quickly. Those who don’t like the burn can easily find a version that is alcohol-free. Using a tongue scraper can help you get rid of the germs that sit on your tongue. Brushing and flossing eliminate the germs around your teeth, but that’s not the only place in your mouth that contains halitosis-causing bacteria. A tongue scraper removes germs way more effectively than a toothbrush, giving you a nice clean tongue. If you incorporate these techniques into your hygiene routine but still have bad breath, talk to your dentist. You may have a larger underlying health problem. Each to their own, but there will always exist some toothpaste that is simply better in dealing with bad breath and other most common teeth problems than some other product of the same type. Looking for an antiseptic and remineralizing toothpaste that will refresh your bad breath and strengthen your sensitive gums? Great, because Charcoal Teeth Whitening Toothpaste has it all. Entirely without fluoride, unlike most other teeth whitening solutions, this toothpaste contains active natural ingredients that are very effective in fighting bad breath. 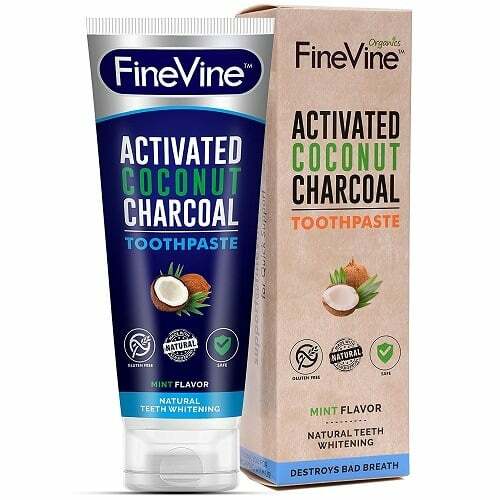 The base of the product is the coconut charcoal powder that eliminates stains from coffee, smoke, wine and tea from your teeth. Coconut oil is already known to have a lot of benefits and as a part of toothpaste it fights cavities, removes plaque build-ups and bacteria and prevents gingivitis. The main culprit for getting rid of bad breath is the refreshing and long lasting peppermint oil. Baking soda is yet another ingredient that gently nudges your mouth for a natural detox. You can rest assured that this product will promote your gum’s health without removing the enamel from your teeth. 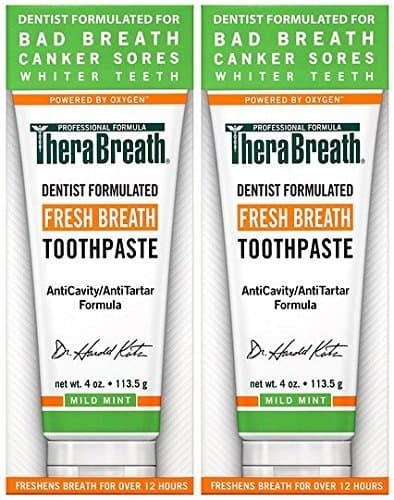 A fast-acting, healthy, natural and effective, the TheraBreath Fresh Breath Toothpaste works instantly to reduce all types of bad breath symptoms. The healthy ingredients based formula with fluoride helps in controlling plaque, tartar and cavities. Alongside with aloe vera, it soothes your mouth while brushing. The product is certified to be vegan and gluten-free. Usually, it acts really fast and is pretty mild. This is possible because it doesn’t contain harsh detergents, artificial colors, flavors and sweeteners. Most importantly, it doesn’t contain sodium lauryl sulfate. For you, this means that the likelihood of developing canker sores is decreased because the SLS in toothpaste is the reason why this happens in the first place. In case you are dealing with dry mouth, you will no longer have to worry about that problem. People who have used this item noticed an improvement even after only a few uses. 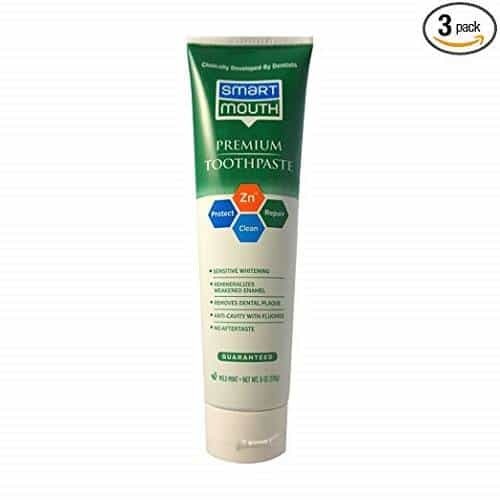 With a long tradition starting from 1993, SmartMouth Premium Toothpaste specializes in preventing bad breath and all its causes. Most other similar products usually only mask it. If your goal, however, is to get rid of bad breath at the source, this whitening solution should be your choice. Once you wash your teeth with it, your breath will remain fresh all day long. This is possible due to the active smart-zinc power technology. A whitening ingredient helps battle sensitivity, while at the same time strengthening your weakened enamel. Plaque and cavity will be something you don’t have to even think about when using this miraculous product. Coming in one of the biggest tubes means it will last you for quite a while. You will appreciate the refreshing, mild mint flavor that keeps your mouth clean and fresh all day. Designed to be the only remedy for stained or yellow teeth you will ever need, Dental Expert Charcoal Toothpaste also beats bad breath and ensures overall dental health. Activated charcoal is the main ingredient with a role to bind and remove any type of stain. There are also coconut oil and tea tree oil in the blend. They work in keeping bacteria away from your mouth and promoting healthier gums. Organic coconut oil is also known to have an additional teeth whitening effect. Curing bad breath, reducing tooth decay, preventing gingivitis and desensitizing teeth are all strengths of this toothpaste. What you get after using it for some time are strengthen enamel, fresher breath and optimal gum health. People who have already tried it noticed relief from oral inflammation, bleeding gums and dental plaque. All this while smelling fresh thanks to the peppermint essential oil – seems like a good deal. 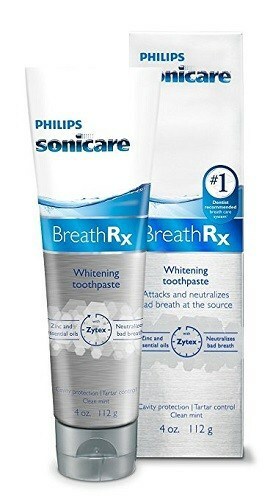 Zytex formula in Philips Breathrx Whitening Toothpaste works hard to neutralize bad breath completely. The formula is actually the mix of zinc and essential oils. The toothpaste itself looks like a blue gel. It is stored in a 4 oz tube, which you can consider a reasonable size for this type of product. If you use it sparingly, which you should because you don’t need too much, it can last for quite some time. Your teeth will get whiter after only a couple of days and you will no longer have to worry that they will decay. Most people who have tried it have just positive things to say about its clean mint flavor. After washing your teeth, you too will notice the fresh aftertaste, compared to the sour one other similar products leave in your mouth. Tea and coffee lovers will especially appreciate this because they will have fresh breath after consuming their favorite potion. Not only that, it will also remove all the stains. 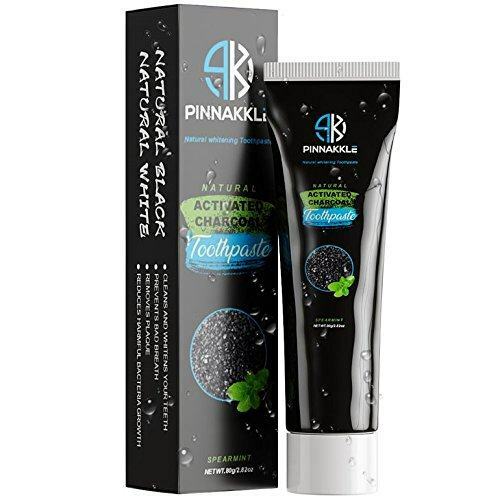 Quadruple and powerful cleansing formula of Pinnakkle’s Activated Charcoal Toothpaste removes coffee, tea and tobacco stains with ease, helping you have pearly white teeth. Besides that, it doesn’t leave a nasty black chalk trace around your gums like most other charcoal based whitening solutions. This only means that it also doesn’t stain the sink. While washing your teeth, you will notice that it is slightly foamy, but nothing too excessive. What this product genuinely does is cleaning your mouth and whitening your teeth. It doesn’t contain fluoride, in case this is important for you. By reducing harmful bacteria in your mouth, this item will prevent gingivitis, cavity and plaque development. Minty and fresh breath is what you get after the application. The best of all, the price is almost a bargain deal for all the benefits you get with this product. It’s not a coincidence that a top U.S. university study showed that Livionex Dental Gel is 250% more effective in cleaning teeth and removing plaque. Made from the safest, most effective ingredients available, this product doesn’t contain sugar, artificial sweeteners, detergents or abrasives to clean your teeth. That’s why it’s so powerful in preventing bad breath, cleaning the mouth and giving that straight-from-the-dentist clean feel. Some even consider it a breakthrough oral care product that leaves your teeth astonishingly fresh and clean. One thing though, when brushing, you might notice the absence of foam in the mouth. Worry not, as this is entirely normal because the item doesn’t contain soap. The color of the gel is blue and it comes in an easy-to-dispense 1.7 oz tube. Peppermint flavor is slightly stronger, so make sure that it doesn’t bother you before purchasing this product. Halitosis is a common occurrence that no one wants to deal with. Unfortunately, it’s something that everyone deals with once and a while. Luckily, treatment can be simple. Remember the first step in establishing a good dental hygiene routine is to find the best toothpaste. Don’t be afraid to try a few brands to find out which one works best for you.